Although lawnmower technology has improved dramatically in recent years, those technological advances sometimes have come at the cost of safety. High-end, zero-turn-radius riding lawn mowers can be prone to hazardous rollovers where the rider can be thrown off the vehicle and exposed to the mower blades. 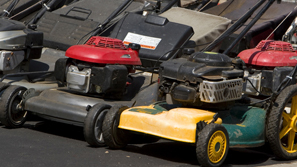 Riding lawn mower accidents have caused numerous serious injuries to riders and bystanders. Defective lawnmowers also have caused fires when fuel lines separate from fuel tanks. Other safety defects – such as blades that become loose during operation or that fail to shut off properly – also have caused serious injuries. Attorney Frank L. Branson is a recognized leader in the use of cutting-edge video and multi-media technology to build demonstrative evidence that resonates with juries. This allows jurors to see and hear exactly what happened in cases involving defective lawnmowers. To learn more about our experience defective lawnmower related matters, we invite you to contact the firm here.